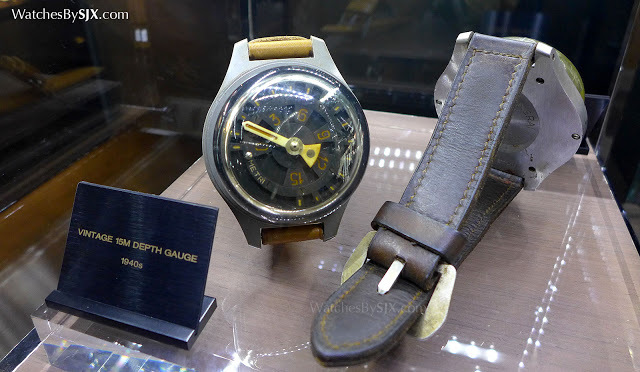 Rare vintage Panerai wristwatches and instruments that chart the evolution of the the brand from Radiomir to Luminor are on display at History and Legend in Singapore. 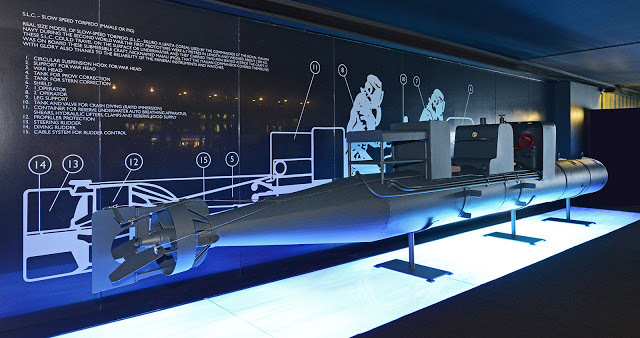 We explain Panerai's storied maritime past with these exhibits. Panerai was already a manufacturer of instruments for the Italian navy, and delivered the first prototype wristwatch to the navy in 1936. These were intended for the navy’s commando frogmen, most famous for their exploits on the Siluro a Lenta Corsa (SLC), a human torpedo. Nicknamed maiale, or pig, the SLC was steered to an enemy ship and its detachable warhead fixed to the ship’s hull. A full size replica of the SLC is on show at History and Legend. The earliest watch on show is a Radiomir ref. 3646 Type A the dates from 1938, one of a small number of exhibition pieces made with an engraved bezel and display back. The Radiomir moniker comes from the radium used as luminous material on the dial, which is made up of two discs: the upper layer with the numerals and markers cut out, and another disc underneath coated with radium. 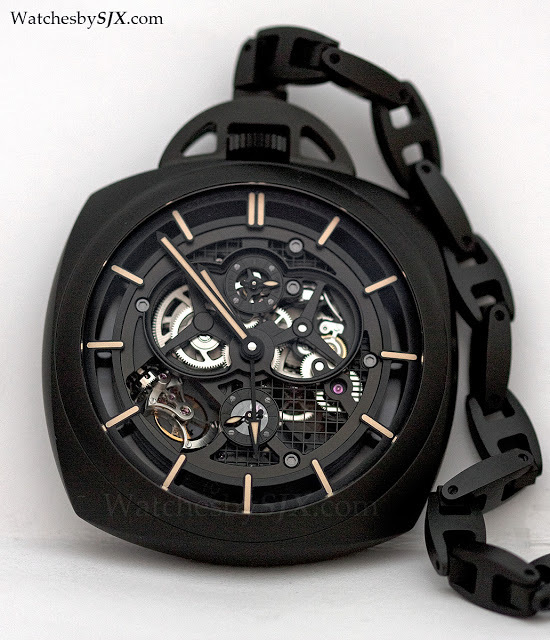 What was originally a black dial has discoloured to a pale caramel colour (something collectors refer to as “tropical”), a process caused in part by the radium. As with all other early Panerai, these were made by Rolex for Panerai. The Radiomir cases are essentially extra-large, 47mm Rolex Oyster cases with screw-down crowns, while vintage Panerai watches were either equipped with Cortebert or Angelus movements. The Radiomir above is equipped with a hand-wound Rolex calibre, based on an ebauche (movement blank) made by Cortebert, a movement manufacturer. The other vintage Radiomir on display was made in 1940. Also a ref. 3646 manufactured by Rolex, this was made for divers of the German navy. The unsigned dial was intentional, to avoid identification of the origins of the watch or the navy unit if the diver wearing it was captured. Panerai’s original specialisation was maritime instruments, including this pair of Bourdon-type pressure gauges from the 1940s. Worn on the wrist, they were used as a depth gauge by Italian navy divers. The one on the left was calibrated for 15m and used by assault divers, while the other could be used up to 30m and worn by divers conducting defence operations like minesweeping. 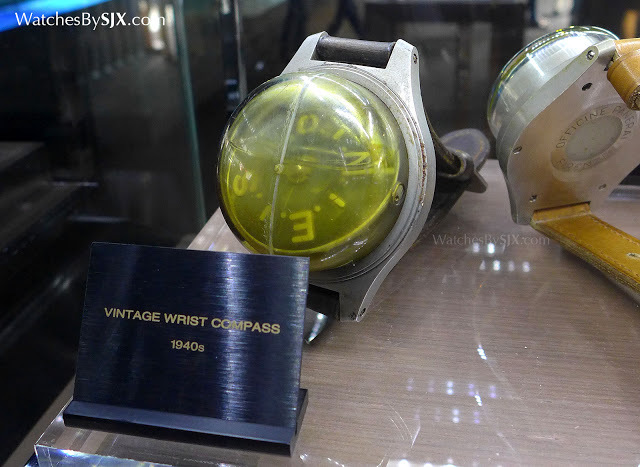 Panerai also made wrist compasses, filled with liquid and featuring luminous indications that meant they could be read even at depths of 5m, or 16ft. To avoid detection by the enemy, the compasses were initially covered with cloth by navy personnel, before a proper cover was devised. 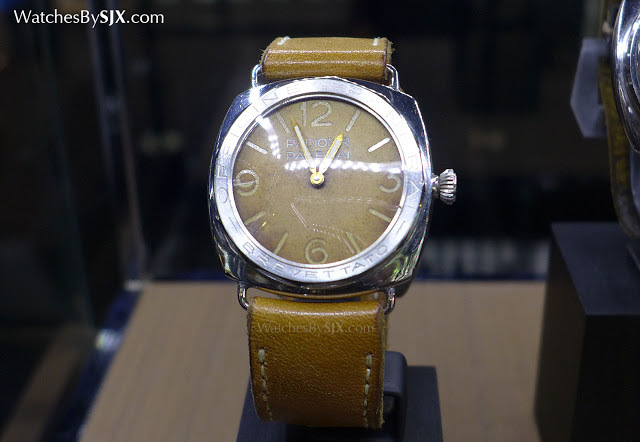 Panerai remained in operation after the war, continuing with the business of wristwatches and instruments. Made for the post-war Italian navy, this prototype ref. 3646 is a transitional model that is the bridge between the Radiomir and later Luminor. It’s also the inspiration for the modern day Radiomir 1940. Instead of radium this uses the non-radioactive Luminor paint for the dial, while the movement is an Angelus with an eight day power reserve. 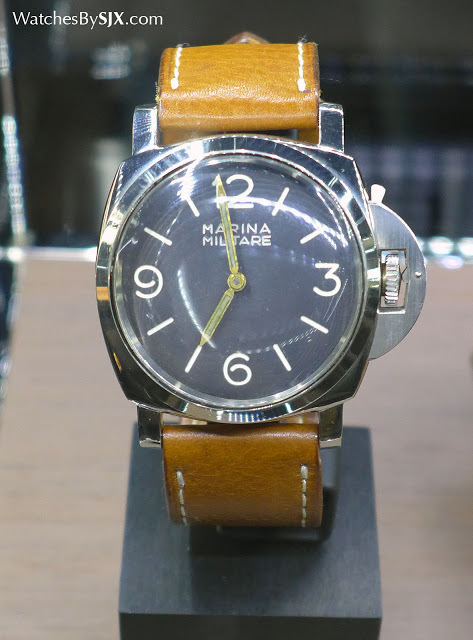 This Luminor Marina Militare ref. 6152 from the 1950s features the crown lock mechanism that is now the Panerai trademark. Equipped with a lever that secures the crown against the case and stem for water-resistance, this 47mm Luminor was a functional improvement over the Radiomir, doing away with the screw down crown. And in a testament to the longevity of Panerai’s relationship with Rolex, the movement inside a hand-wound Rolex movement. Produced in 1956, this Radiomir Egiziano G.P.F. 2/56 is the prototype of the series of dive watches made for the Egyptian navy. Even larger at 60mm in diameter, the Egiziano features a rotating bezel with round five minute markers which later became the basis for the Submersible line. Only 50 Egizianos were ever made, all equipped with the eight day Angelus movement. 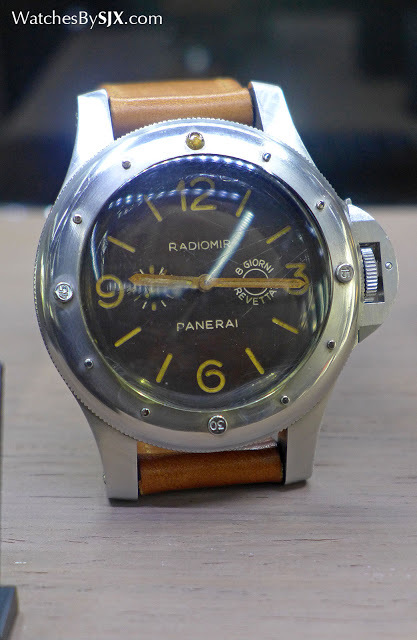 By the 1960s Panerai wristwatch production had ended as its contracts with the Italian and Egyptian navies concluded. 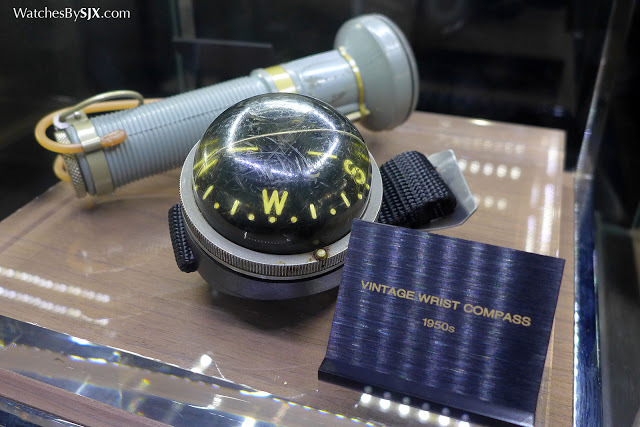 It still manufactured instruments, including the wrist compasses and waterproof torches. 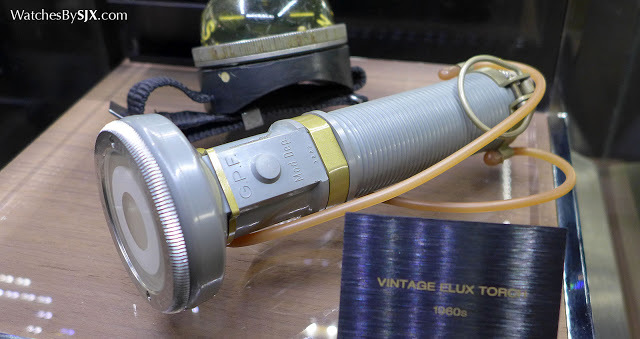 Conceived as a precise source of light, the ELUX flashlight was used for signalling rather than illumination. It has a rubber-coated metal body with a pressure compensation system and locking mechanism for the on-off button that prevents accidental activation at depth. Panerai only crept back into watches beginning in the 1980s, remaining a niche watch brand until luxury conglomerate Richemont took over in 1997. 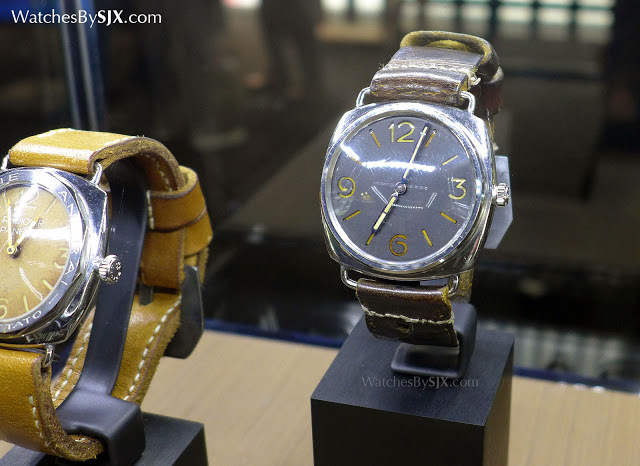 The rest of the exhibits at History and Legend comprise modern day Panerai timepieces, including the new additions from SIHH 2015 as well as the Submersible line-up. History and Legend takes place on the ground level of ION Orchard, outside the mall facing Orchard Road, from August 26 to September 6, 2015. It’s open daily from 11am to 9pm. 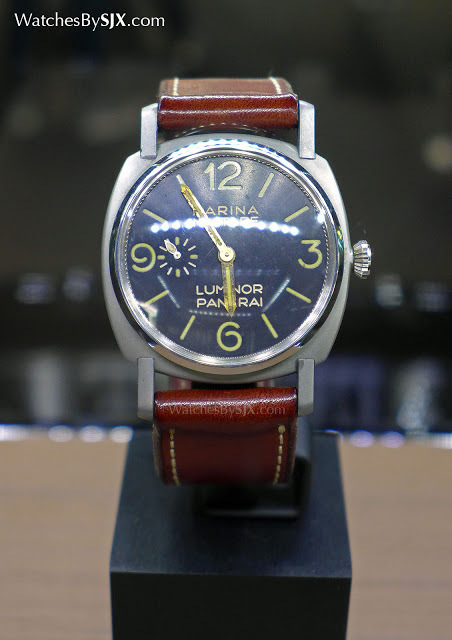 Had hour guided tours are available at 3pm and 5pm, with registration required at the Panerai boutique in ION Orchard. Admission and guided tours are free.